In 2012 I couldn’t have imagined that I would be getting ready for the biggest event of my career. 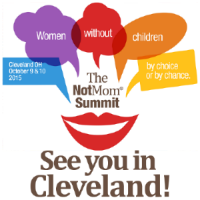 I imagined The NotMom Summit back in 2013, not long after I started writing for the website. Would it be useful for women like us to have a place to go and share our experiences and lessons learned? Whether we have chosen this path or have come to it under other circumstances, we all have stories to tell. And, so we did it. We really, really did it. I can’t take that much credit. Karen Malone Wright has been the fearless leader that this kind of event needs. I helped out when and where I could and on Wednesday I fly to Cleveland to meet Karen face-to-face for the first time – a woman I’ve been working with, very closely, for the last three years. This reality is somewhat overwhelming. All of the work we’ve done comes down to this and now whatever happens, happens. This weekend attended the wedding of two of our closest friends here in Asheville. I put the NotMom Summit out of my head for two days as I celebrated with an amazing group of people – moms and NotMoms alike. There is always a combination in any crowd whether you realize it or not. The wedding was a beautiful distraction. But today is back to reality, and the reality that I am about to step on a plane and get off in a strange town where I’ve had a hand in bringing together what I hope is the largest crowd of women without children in one place. Here we can share our stories, enjoy our company, learn from each other, and celebrate our lives. Thanks to everyone who has helped make this dream come true. Will I see you all in Cleveland?